Lawrence of Arabia is a 1962 British epic film based on the life of T. E. Lawrence. It was directed by David Lean and produced by Austrian Sam Spiegel (through his British company, Horizon Pictures), from a script by Robert Bolt and Michael Wilson. (Lean and Spiegel had recently completed the acclaimed film The Bridge on the River Kwai.) The film stars Peter O'Toole in the title role. It is widely considered one of the greatest and most influential films in the history of cinema. The dramatic score by Maurice Jarre and the Super Panavision 70 cinematography by Freddie Young are also highly acclaimed. 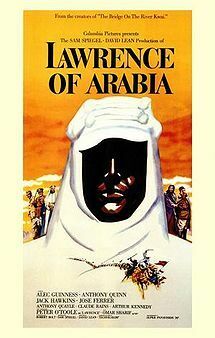 The film depicts Lawrence's experiences in Arabia during World War I, in particular his attacks on Aqaba and Damascus and his involvement in the Arab National Council. Its themes include Lawrence's emotional struggles with violence in war (especially the conflicts between Arab tribes and the slaughter of the Turkish army), his personal identity, and his divided allegiance between his native Britain and its army, and his newfound comrades within the Arabian desert tribes.